For three classes at Oak Ridge High School, the future of the old Oak Ridge Mall property is something the students are taking personally. 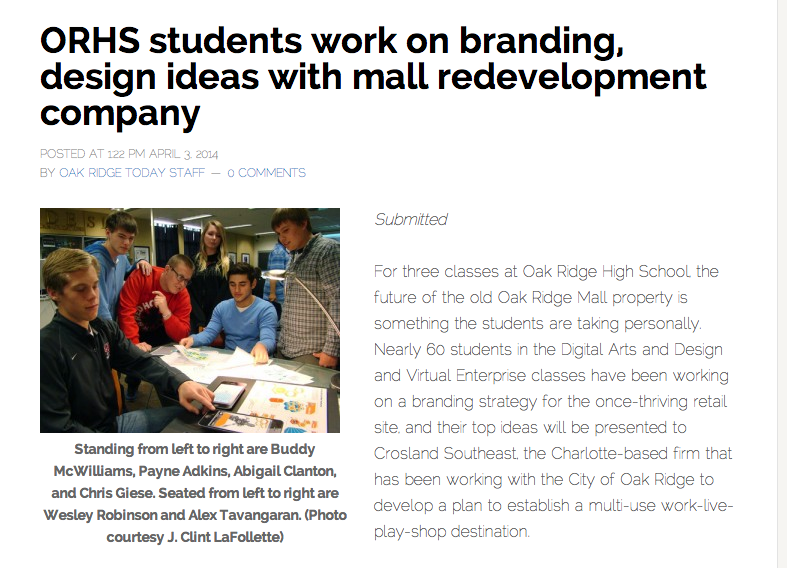 Nearly 60 students in the Digital Arts and Design and Virtual Enterprise classes have been working on a branding strategy for the once-thriving retail site, and their top ideas will be presented to Crosland Southeast, the Charlotte-based firm that has been working with the City of Oak Ridge to develop a plan to establish a multi-use work-live-play-shop destination. Crosland Southeast approached Oak Ridge School Board Chairman Keys Fillauer with the idea to work with the students, and an enthusiastic Fillauer discussed it with ORHS Principal David Bryant and teachers Linda Ousley and Clint Lafollette, and the project was off and running. Ousley is the facilitator of the school’s Virtual Enterprise program. Ousley said that Crosland Southeast will get a good cross-section of Oak Ridge opinion by talking with the students, and the students are getting excellent experience they can use on their future resumes. “We have conducted research on similar developments, and we will also do focus groups with other students to see which branding ideas work making sure we have included input from all age ranges at the school,” said Chris Giese, an ORHS senior who is working on the project. Giese and McWilliams also serve as the CEOs of the ORHS virtual company, Cynosure Telecom. The class operates as a real-world virtual company and gives students the opportunity to work in a business environment and learn how to be successful in this type of setting. “Our company includes all of the areas you would have in a typical business, such as web designers and a marketing department,” Giese said. The students have come up with hundreds of names as a starting point, and the teachers will help them narrow down their list and focus on a few key names that capture the essence of the project. According to estimates, the proposed new development will create almost 1,000 new jobs and increase annual city and county sales tax revenues by more than $2 million. At final build out, the private investment in the project could total approximately $80 million. Crosland Southeast plans to announce a more definitive project schedule over the next several months. Overall, the students, like most Oak Ridgers, hope that it works—“we want it all to work…the ideas we come up with, and more importantly the success of the new development. It will be cool to be a part of the branding and design, regardless of what it ends up being,” said Payne Adkins, an ORHS senior. The findings and recommendations of the students will be presented to Sittema and James Downs from Crosland Southeast before the end of the current school year for the developer to incorporate into their final branding plans and strategies.